A low profile garbage disposal is an undermount device unit for disposal of kitchen waste. You don’t need to allocate a lot of space to install the disposal unit. Keep in mind that even though this disposal unit is comparatively smaller in its dimension, it does not mean that the unit will underperform for you. As a matter of fact, there are some leading brands in the market like Moen, Waste King Legend and InSinkErator which has built some of the highest quality units of garbage disposal which can perform just as efficiently when grinding up some of the toughest food waste which are usually expected only from those of the higher end garbage disposal units. 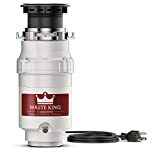 If you love cooking in the kitchen but do not like cleaning up the leftovers after dinner that have been dumped in the trash kitchen, then you will definitely deserve a compact garbage disposal for deep sink which is quite small, and you can easily install it right under your kitchen sink. This powerful little machine will help you do that extra mile in keeping your environment clean. WHEN DO I NEED A LOW PROFILE GARBAGE DISPOSAL? If you have a limited kitchen space at home, especially in the apartments where the sink space is ridiculously small, your target should be to keep your cooking area as spacious as possible. Planning to purchase a garbage disposal which is massive in size will only lead to more cluttering and additional shifting of the drain pipes underneath the sink. Opting for a small garbage disposal will help you to manage your kitchen space efficiently without having to compromise on the space. 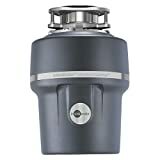 The Waste King L 8000 is a continuous garbage disposal, and it is currently rated as one of the most reliable units in the product collection belonging to the brand Waste King Legend. This low profile garbage disposal is a solid built, and it is very powerful, highly affordable and quite easy to install at home. The 1 HP makes for highly powerful grinding service. It uses the EZ mounting unit which is highly popular for its quick and easy system of mounting. It has a quiet operation with the sound dampening shell which is a kind of insulated foam. It is equipped with a magnet motor which is currently very popular for its energy efficiency. 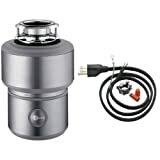 The InSinkerator Evolution compact garbage disposal with its 3/4 HP motor power is the perfect solution for you if you have a small kitchen sink space a home. It is a product of the Evolution series and the manufacturers claim that the unit has the potential to grind a wide variety of food types without making much noise. 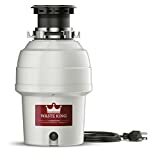 If you are looking for something “bullet proof” than you will definitely love this steel clad Waste King A1SPC Knight Garbage Disposal unit with its 1.0 Horse Power motor. As if this is not enough, it even comes with an exclusive silencer technology which will all grinding operations noiseless. This garbage disposal for deep sink is quite a buy with its generous sizing. This reliable unit will spin at about 2700 (rpm) revs per minute. In other words, all food you put in it will be mashed up in a matter of a few seconds! It is so powerful that just one grinding pass is more than enough. The InSinkErator Evolution Excel 1.0 HP low profile garbage disposal is the right pick for those of you who want only the best for them. It is the “Mercedes Benz” of garbage disposal units in the market right now. The InSinkErator Evolution XTR Essential 3/4 HP Garbage Disposal is the latest version of the older Essential model from the series Evolution. The XTR is the short form of extra accessories and this garbage disposal for deep sink is popular for its multiple features – something which you will not find in a lot of garbage disposal units. The anti vibration mount effectively reduces the level of vibration in the sink. The Waste King 3/4 HP Legend Series L 3200 compact garbage disposal has a continuous feed operation for efficient waste management at home. If you have a small kitchen sink space, you will love this one because it measures only 7 to 3/4 inches when it comes to the diameter. The length is 13 to 3/4 inches and weighs about 8.6 lbs. We love the 2700 RPM high speed motor which runs at a 115 volts and hardly ever jams even though it is small in size. Most of all, it is easy to clean! If you are on the lookout for a high end garbage disposal unit that performs excellently, than the InSinkErator O1100XL Pro Series with 1.1 HP is the perfect choice for you. It has a multi grind advanced technology with an additional 3 stage feature. These features combined with the sensor circuit is a perfect combination of top of the line performance. You can even increase the motor torque up to a massive 500 per cent with the help of the 1.1 Horse Power performing motor. The 40 ounce grind chamber enables you to finish your work in one go. InSinkErator Contractor CNTR333 3/4 HP 333 is a garbage disposal for deep sink with so many benefits. The performance level is one of the front runners in the market under this price range and is highly reliable when it comes to the quality. The company has offered an in-home warranty which is exclusive to this model. The feed is continuous which means you can grind and dispose off your food waste without having to keep it inside of the unit which can be quite messy. You can just dispose the food waste as you cook for your family in the kitchen. The food can now go right into your kitchen sink and are liquefied instantly so it can flow immediately into the sewage and keep your drainage system clean. 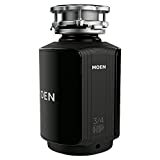 If you are looking for a compact garbage disposal which is ideal for everyday use than the Moen GX GXS75C Series, 3/4 HP is the perfect choice for you. This unit has the capacity to produce about 2700 RPM power for grinding to dispose all your kitchen waste at home. It uses the sound shield ™ technology for sound deadening purposes. It is ideal if you have infants at home because it will not create any noise whenever you use it. You can install this Moen GX GXS75C Series in just about any existing mounting 3 bolt assemblies because of the universal Xpress feature. Many users have reviewed that this unit hardly ever jams when it is in full grind mode. 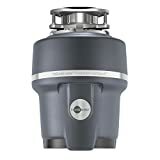 If you are looking for a reliable but cheap low profile garbage disposal than the Waste King L 1001 Legend Series 1/2 HP is the right choice for you and your household. This unit may be on the affordable side of pricing but its performance is something to be reckoned with in the market right now. It is for light to moderate waste disposal usage at home. It has a very slim body that is capable of easily fitting underneath narrow kitchen sink areas. The grind chamber is corrosion proof and has a long lifespan. WHAT ARE THE BENEFITS OF INSTALLING A GARBAGE DISPOSAL FOR DEEP SINK? For starters, your kitchen will look a lot cleaner and hence a lot more attractive. A lot of people are surprised with this, but the truth is that this compact unit is a much better and more hygienic alternative to your stinky food trash bin under the sink. This is a great investment especially for protecting the environment around you. Decomposed food produces greenhouse which is released into the atmosphere so using this would considerably reduce it. It will save you a lot of trips to the nearby garbage bin and a lot of arguments with your spouse about who will take out the trash to the bin. Using a compact garbage disposal will also cut down on the level of food wasted even to its smallest form and thereby decreasing the foul odor that emanates from the kitchen area. By using this unit, you are also helping to reduce the amount of waste that lands up in massive landfills. Before you go out there and purchase just about any low profile garbage disposal that you set your eyes on, you might want to read a reliable buying guide as a safety net before splurging all your money on a model that might turn out to be not as effective for your requirement. First thing is for you to find out the available size of the space underneath your kitchen sink. In addition to this, consider the number of people in your household. Getting a detailed physical dimension of the space underneath the sink is of vital importance because the garbage disposal will be installed there. You can refer to the manual in the product which will give you an idea of the exact measurement of the unit so you can compare it with your kitchen sink. WHY IS HORSE POWER IMPORTANT? Now you know why it is more beneficial for you to invest in a short garbage disposal for deep sink. But you should also get a clear idea on the significance of Horse Power and how much of it is more efficient for you. The 1/3 HP motor is the least powerful and the cheapest you will find in the market right now. It may be weak, but it is still widely popular among a lot of buyers who are either living alone in apartments with one bedroom or for couples. It is also a great purchase for short term solutions. These motors are efficient enough to grind up softer foods like the vegetables but are not ideal for hard bones. Be careful when you take use it because they usually have a tendency to get stuck if you happen to overload it when grinding the food. Since these models are the cheapest in the market, it also means that the components that have been used to make it are also cheap and hence have the tendency to rust easily after a short period of time. If you have a household of just one or two people or perhaps three, then the standard garbage disposal would be exactly 1/2 horsepower. This thing has the potential to grind just about any kind of the food waste that is produced at home. Since you are a household of just few people, you will probably be living in a small apartment, and the compact size and affordability will also suit you a lot. The price varies a lot in the market depending on the type of model and even the brand, but you will normally get an impressive one for just under $ 90. The best ones come in stainless steel components which makes it durable for many years to come. 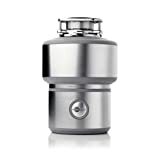 A majority of the most purchased short garbage disposal units fall under this category of power range. If you are a household of around 2 to 4 people than the 3/4 HP is ideal because it is strong enough even to tackle even the most fibrous items of food like those of the celery, asparagus, lettuce and potato peels. The disposals in these units are usually bigger as compared to the 1/2 and 1/3 HP. Even the size is comparatively bigger than the other two, and hence they are more expensive. It is widely popular for the noise suppression and multi stage grinding features. This is highly powerful, and it is widely suitable for large households and even for commercial areas. It is great for homes with 3 to 6 people. They are large in size and costly, but there are also reliable models that you can easily find within the pricing range of the 2/3 Horse Power. Consumers love it because it operates quietly, has multi stage grinding and hardly ever jams. It also easily grinds hard foods like coffee grounds and tiny bones. The HP requirement in your disposal unit should actually be decided according to the size of your kitchen and household. 1/3 or 1/2 HP power is perfect if you are a household of just 1 – 2 persons. If there is around 3 – 4 of you at home, then opt for the model that has 1/2 – 3/4 HP. Anything beyond that would rather be a waste and will clutter up your kitchen. Hello, im living with two family members .We are considering to buy small garbage disposal for our apartment. Is Waste King L 1001 enough for three persons? Price is really good, we don’t want to spend much money right now. L 1001 is designed for 2-3 members max. Just be careful not to overwhelm it.